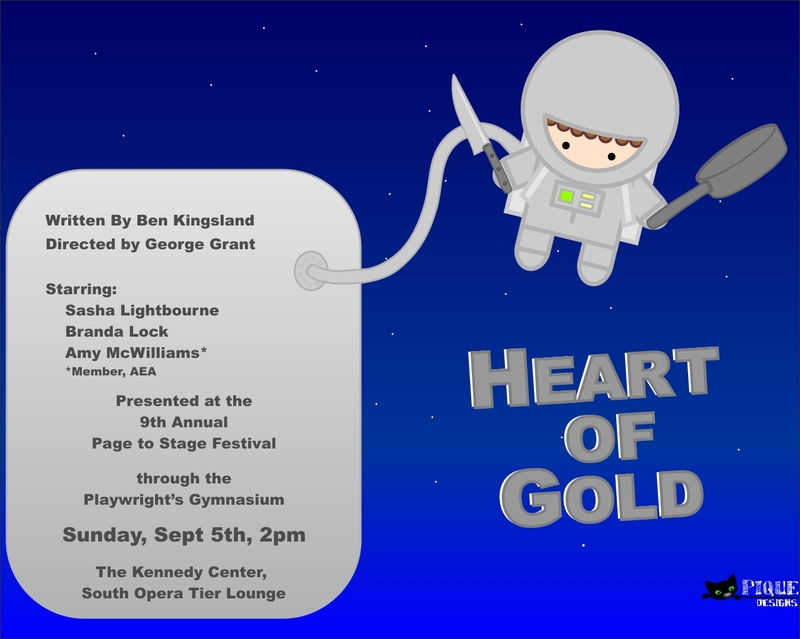 An exciting playwriting development; two of my shows are going to be performed at the Kennedy Center as part of the 9th Annual Page to Stage Festival! A great writing group I’ve been with for a year called the Playwright’s Gymnasium is the sponsor. In Heart of Gold, Donna Dune is a second-tier Food Network host who finds herself in sudden need of a PR facelift. To prove to the world how warm-hearted she is, she decides to open up an orphanage. Donna’s about as maternal as scalded milk, and her assistants Leighann and Sprite know it, but it’s up to them to put this terrible idea into practice or lose their jobs. How long can the crafty assistants keep Donna’s ambition in check; and what will they do if any orphans show up? And then my one-act Null will be performed with a whole series of one-acts by the rest of the Gymnasium members, Patrick Bussink, Chris Graybill, Mary Watters, George P. Tilson, Eric Peterson, Rich Espey, and D.W. Gregory. That’ll be Monday, 9/6, at 2 PM. Null is a period piece about a natural philosopher on the hunt for phlogiston; nothing in the laboratory is going right, until his wife helps him out in some surprising ways. Everything during Page-to-Stage is totally free and open to the public. Come early and often to see my shows and all the other cool new work being showcased.